Theresa Muñoz is a poet and critic whose debut collection ‘Settle’, published last month by Vagabond Voices, explores themes of national identity, immigration, racism and social media. We approached Theresa to write about her collection and the background to her work. I was born and raised in Vancouver, Canada, moved to Glasgow and now make my home in Edinburgh. I have always lived on coasts; first west, now east. I am soon to be sworn in as a citizen of the United Kingdom but will also keep my Canadian citizenship, a small detail that makes me happy. This road to naturalisation took ten years to travel and included a student visa, post-study work visa, temporary partner visa, permanent residence permit and, finally, UK citizenship. During all that time, I wrote poems about my experiences and they are now published in my debut collection Settle (Vagabond Voices, 2016). I tell their story to feel less lonely. twin dark heads in the snow. replaced by crackling microphone sighs. For hours it’s the moon-textured walls. White chairs melt into a white floor. Another poem “Ashton Lane” describes a fight between my partner and a man who asked where he“bought” me. In a recent interview with a national newspaper, I spoke honestly about these encounters, and was saddened by the online comments I received. One said “Well, where did he buy her?” I was told to go back to the “Filo-pines” and several people argued that when someone yells “nice tan” to a non-white person in Scotland (and all his pals guffaw) it’s actually a term of endearment. Some comments referred to my appearance and ethnicity and are too degrading to repeat here. I sat in my Edinburgh flat in tears wondering what I had done to deserve this and whether I had made a mistake by speaking up in the first place. It’s ironic, then, that the other theme in my collection is social media. The second sequence is called “Digital Life” and includes poems about Facebook, Google, texting and other forms of digital communication. This theme is important to me. I am fascinated by how much we should reveal about ourselves and how we brand our online image. For instance, my poem “Googling the Other Theresas” is about women in hyperspace who share the name Theresa Muñoz. it would all become real. And I could become real. 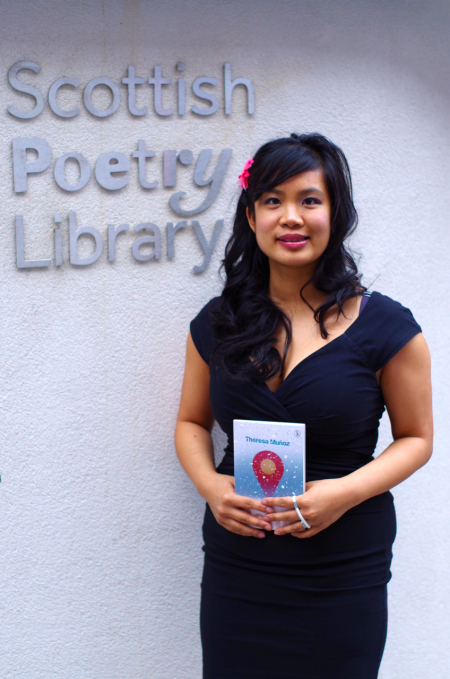 Theresa Muñoz’s debut collection Settle is available now from Vagabond Voices, £8.95. Great piece Theresa – really enjoyed the poetry. Apologies for the boors and bigots, they have no other outlet for their sad confused lives, other than to abuse others. I’m impressed to see you had the strength to come through this, and can remain un-bittered and pour your experiences into creation. There’s plenty here to inspire you also, you’ll see. You are just the kind of person that will help us become the Scotland we want to be. Good luck! Vancouver is a beautiful place, I have been lucky enough to visit. One of the few places in the world in fact where I imagined I could more than happily make a new life for myself. Interesting to read about someone who did the reverse and in fact made a new life for themselves. Lovely piece. Welcome to Scotland, Theresa, and please continue to ignore the racist scum of our country when you can. I have a Filipino-Californian friend called Jesse Quinsaat who was at Edinburgh uni with me in the early 1970’s – when he was a pioneer surfer here on the beaches of East Lothian! He is still passionate about Scotland and gave me his copy of Arthur Herman’s book on the Scottish Enlightenment. I hope from now on it’s the good and enlightened people of Scotland you experience. The new series of poetry by young women is great. Some beautiful words. Is that a deliberate choice or does it just happen that the poets being showcased are all young women? Oh… and any recommendations for the Festival, whether in poetry / spoken word or in general?